This idea of things being Anicca (impermanence) is a very famous Buddhist thought. The basic idea is that everything is ever-changing. In Buddhism, the three marks of existence are three characteristics (Pali: tilakkhaṇa) shared by all sentient beings, namely impermanence (anicca), suffering or unsatisfactoriness (dukkha), and non-self (anatta). Anicca (impermanence), dukkha (suffering), and anatta (insubstantiality/ non-self) are the three characteristics common to all sentient existence. The anicca (impermanence) is one of the essential doctrines or three marks of existence in Buddhism and preached by Buddha. anicca is a pali word composed with two combined words: "nicca" and the privative particle "a". "nicca" implies the idea of permanence, of continuity. anicca means the absence of continuity, the absence of permanence. 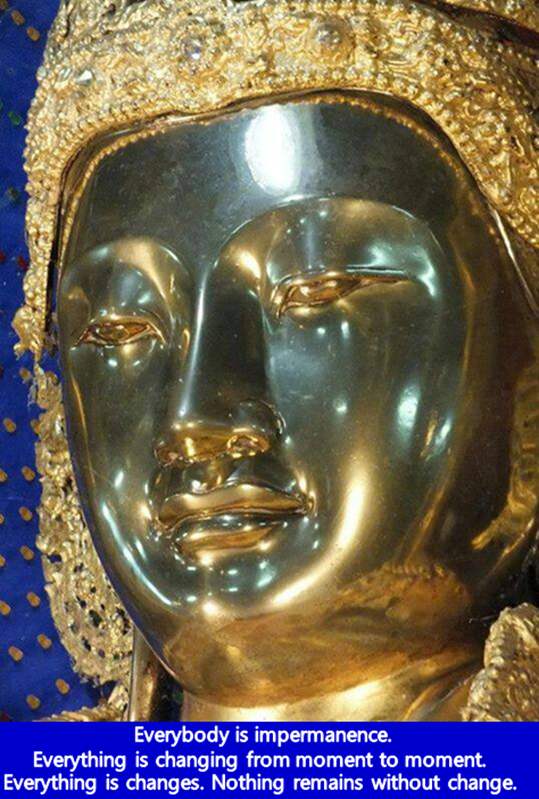 ‘Anicca’ is the Buddha concept since 588 BC that all of existence is in a constant state of flux and impermanence. Buddhism is now 2,603 years old and has about 1600 million followers worldwide. The Lord Buddha was born in 623 B.C. in a country called Kapilavatthu in Nepal. Born in the noble Sakya clan, he was named Prince Siddhattha Gotama. The Lord Gautama Buddha gained a flash of insight that he felt gave him an answer to the problem of suffering. He began to share with other the meaning of His enlightenment since B.C 588. The Lord Buddha and his disciples travelled vast areas (on foot) throughout India to expound the Dhamma, helping lots of suffering people along the way. His relentless effort lasted for 45 years. For the 45 years (between 588 BC– 543 BC), the Buddha spent his time travelling around India and neighbouring countries, preaching and teaching about the Four Noble Truth and the Noble Eightfold Path. The Noble Eightfold Path is one of the principal teachings of the Buddha, who described it as the way leading to the cessation of suffering (dukkha) and the achievement of self-awakening. Anicca (impermanence or inconstant), dukkha (suffering or unsatisfactoriness) and anatta (non-existence or non-selfhood) together make up the ti-lakkhana, or three characteristics of all phenomenal existence. That the human body is subject to change is empirically observable in the universal states of childhood, youth, maturity, and old age. Similarly, mental events come into being and dissolve. Recognition of the doctrine of impermanence is one of the first steps in the Buddhist's spiritual progress toward enlightenment. Impermanence is one of the essential doctrines or three marks of existence in Buddhism. The Buddha says, "Life is suffering". What does "suffering" mean? The sutras say: "Impermanence therefore suffering". Everything is impermanent and changeable. The Buddha says that life is suffering because it is impermanent and ever-changing. For example, a healthy body cannot last forever. It will gradually become weak, old, sick and die. One who is wealthy cannot maintain one’s wealth forever. Sometimes one may become poor. Power and status do not last as well, one will lose them finally. From this condition of changing and instability, although there is happiness and joy, they are not ever lasting and ultimate. When changes come, suffering arises. Thus, the Buddha says life is suffering. Suffering means dissatisfaction, impermanence and imperfection. If a practising Buddhist does not understand the real meaning of "suffering" and think that life is not perfect and ultimate, they become negative and pessimistic in their view of life. Those who really understand the teaching of the Buddha will have a totally different view. We should know that the theory of "Life is suffering" taught by the Buddha is to remind us that life is not ultimate and lasting, and hence we should strive towards Buddhahood — a permanent and perfect life. The Buddha passed into Parinibbana (or passed away in simplified layman's term) at the ripe old age of 80, B.C 543. When Buddha died, his physical death is defined as Parinibbana. Known as the Buddha or Enlightened One, Gautama Buddha taught that people can escape the circle of rebirth by eliminating desire and by following rules of behaviour, the Noble Eightfold Path. Since B.C 588, Buddhism has become one of the world's great religions. Buddha did NOT claim to be God. Buddha did NOT claim that he was God, the child of a God or even the messenger from a God. Buddha claimed that he was a noblest person who perfected himself and taught that if we followed his example, we could perfect ourselves also. The Buddha is NOT a creator God. The Buddha is the supreme teacher of humans and Gods, who teaches us the way to restore Wisdom and Understanding by conquering the greed, hatred, and ignorance which blind us at the present moment. Teaching of Buddha is like that immeasurable sky and universe with no end at all. Teaching of Buddha is more many years earlier than discoveries famous scientists. Teaching of Buddha is more supreme than science, philosophy and most supernatural powers abilities. Buddhism is certainly more scientific than any other religion. The Buddhism is more scientific verifiable than other religions. (BUT, all religion is good. All religion has good teaching accordingly). Did the teachings of Buddha influence great Philosophers? Heraclitus is pretty cool in Buddhism. Confucius is pretty cool in Buddhism. They may be strongly influenced by Buddhist philosophy. Heraclitus of Ephesus (535 BC – 475 BC) says about impermanence. Heraclitus of Ephesus was one of the Greek philosophers in the world. Nothing is permanent; life is a flux. Heraclitus has said that you cannot step twice in the same river. It is impossible to step twice in the same river because the river has flowed on; everything has changed. And not only has the river flowed on, you have also flowed on. You are also different; you are also a river flowing. Like River you also have quite a lot of things moving in your life, happiness, depression, joy and sorrow all are moving at the top of your life. But something inside you is never changing and omnipresent. The moment you can find that center which never changes. Then everything about your life also changes. A river by its very nature is never the same, because the water has changed, never to return, you can never step into the same river twice. Impermanence is one of the three marks of existence. Heraclitus holds and recommended about Buddha’s impermanence or doctrine of impermanence Buddhism (anicca). No man ever steps in the same river twice, for it's not the same river and he's not the same man. – Heraclitus is cool in Buddhism. He was right. The water in the river today is completely different from the water we bathed in yesterday. Yet it is the same river. 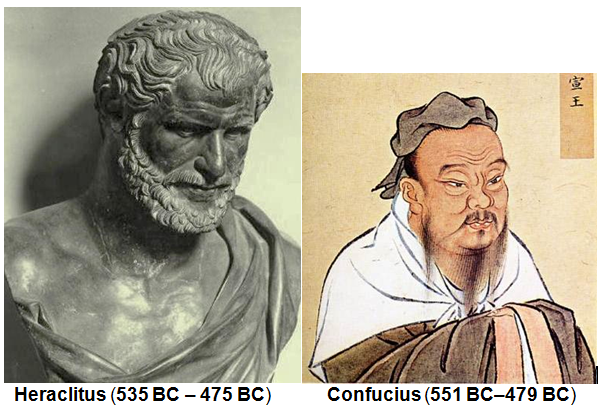 When Confucius (551 BC–479 BC) was standing on the bank of a river watching it flow by he said, “Oh, it flows like that day and night, never ending.” Confucius was a Chinese teacher, editor, politician, and philosopher of the spring and autumn period of Chinese history. Standing by a stream, the Great philosopher (Confucius) said, It flows on like this—does it not?—never ceasing day or night. We imagined, one day Confucius and his students traveled to a river bank. They saw the current of the river was constantly pushing forward. In sight of this nature’s phenomenon, he alerted his student time could not be turned back and there were a lot to be done in our limited lifetime. Everything is changing from moment to moment. All entities move and nothing remain still. I believe impermanence (anicca) is natural universal law based on truth. I also believe impermanence (anicca) is impermanent. Everyone is always dying and being reborn, everything changes. Impermanence (anicca) is more than an idea. It is a practice can help us to see the true nature of reality. Just as the light of a candle has the power to dispel darkness in a room, so also the light developed in one man can help dispel darkness in several others. As in the days of the Buddha (BC 623-BC 543), one should work hard to maintain the awareness of anicca, and if one can do so he will surely get himself rid of many troubles. Buddhist philosophy is the elaboration and explanation of the delivered teachings of the Buddha as found in the Tripitaka and Agama. Its main concern is with explicating the Dharma constituting reality. (In Buddhism, an agama (sacred work or scripture) is a collection of Early Buddhist scriptures). The Buddhist Path is a gradual path, a Middle Way consisting of Virtue, Meditation and Wisdom as explained in the Noble Eightfold Path leading to happiness and liberation. We can get peace of mind through meditation on Anicca. Together we can all get through life’s challenges by teaching of Buddha.